Ubuntu in transition: what’s in store for the popular Linux distro? It’s strange – even six months after founder and returning CEO of Canonical, Mark Shuttleworth, announced that the Unity project was dead – to hear Unity 8 described as a “bad investment” by a Canonical employee. Will Cooke, desktop manager at Canonical, seemed quite comfortable with the new narrative when we spoke to him on release day, although he preferred to use the term ‘parked’ in relation to Unity 8 rather than closed, which would appear to open the possibility of Unity 8 being reversed out of its ‘parking bay’ in the future. However, given the widespread support for Wayland now, and the Ubuntu desktop team’s own support of Wayland, it seems unlikely that Mir will become the default display server on Ubuntu’s desktop distro. Whatever you think of Gnome 3 returning as the default desktop, Ubuntu 17.10 is a defining fork in the road for the distribution that’s used by millions of Linux users, so for this interview we were mostly concerned with the transition. Question: Can you tell us how the run-up to 17.10 has gone? Will Cooke: We decided that Gnome Shell was the right toolkit for our users. We’ve used Unity 7 for six or seven years and all the core set of applications were built around the Gnome desktop, so going to Gnome made the most sense. The transition path between Unity 7 and Gnome on the desktop was hopefully going to be fairly straightforward, quite smooth and it’s turned out to be that way. So now we’ve got the latest Gnome desktop running on Ubuntu. We’ve put our stamp on it to make sure the users that have been using Unity 7 for the last six or seven years don’t suddenly upgrade one day and find that the desktop that they are used to using, in the way that they have been using it, indeed all of the examples and the screenshots on the internet, are still relevant to the new desktop. So we’ve added a couple of extensions in there to add the launcher back and a few features that we felt were missing from the desktop that were there in Unity and not in Gnome. [...] All that work was done with the blessing of the Gnome community and with the blessing and support of those extension developers. Any new features we’ve added there or bug fixes, have been done upstream rather than hosting it ourselves and keeping it for Ubuntu only. The plan is that when you upgrade to 17.10 you’ll see something familiar and something that you feel at home with. Some of the user interactions are a bit different, but we don’t think they are so different that people are going to struggle with Gnome Shell and the initial results say, yes, that is the case, so we’re very pleased that people are able to get it working and use it and don’t feel they have to overcome or learn a new way of working. Q: You mentioned session-override. Could you explain that for our readers? WC: All the things that we’ve changed to make it Ubuntu are completely temporary. When you log in, they are applied and when you log out, they are gone. Your settings will continue to be your settings, but all of the tweaks that we make are applied at session time, so there’s no patches to Gnome, or source code, to make stuff work the way that we want it to work. It’s just upstream Gnome with a few tweaks to it. There’s no Ubuntu secret sauce in there: anybody could recreate what we’ve done by taking upstream Gnome code, compiling it and applying our settings. Q: How was GUADEC in Manchester for you and the team this year? WC: It was great. We had quite a strong showing there. I think we had six or seven people there. People from Europe and the US and even New Zealand. We sent a good team of people there who have worked with Gnome in the past and have been active members of the Gnome community for a long time, so we know a lot of the guys there and they know us and so we went along without any preconceived ideas about what we were going to do – no real agenda. We just wanted to go and speak to them and get some ideas from them, hear their input on the way we wanted to do things and what our ultimate goal was and they were extremely welcoming to us. We had some good conversations during the conference itself and afterwards there’s the unconference for the hacking sessions where people get together and do some code and we stayed for all of that as well. We had plenty of discussions in the hallways and some of the sessions, to talk about the way we wanted to do things, and that’s what led us to be able to ship the Ubuntu-specific code, the Ubuntu session, as a session override. Rather than having to patch Gnome, we could implement our own stuff: take vanilla Gnome and add our stamp to it without having to patch lots and lots of pieces of software. That was a direct outcome from GUADEC and it worked really well for all of us […]. Q: Was Tim Lunn, Ubuntu Gnome technical lead, walking around with a cheesy grin on his face? WC: [Laughs] Yeah, he was there. There was some confusion about whether or not Tim worked for Canonical or not, so it was good that we were there to explain the situation. He’s an active member of Ubuntu Gnome and has been for a long time and there was confusion about what was going to happen to the Ubuntu Gnome project – was it going to continue? Was it going to be killed off? Who was working for who now? 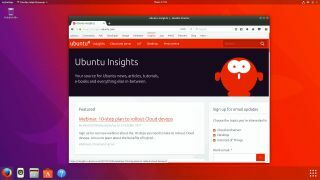 And so we were able to explain that Ubuntu Gnome and Ubuntu are now effectively the same project and people working on Ubuntu Gnome would continue to work on the things they were passionate about. It just happens that the fruits of their labour would now be in front of millions and millions of users, so it’s worked well.